Aretha C. Smith began her professional writing career in 2004. She has authored several training guides for Dalhousie University, where she is pursuing a Bachelor of Arts in English. Smith also holds a diploma in library information management from Nova Scotia Community College. Though the hair of children of color requires the same basic care as children of other ethnic groups, there are noted differences. To ensure the hair of an African American child grows at a healthy rate, a regular hair care regimen must be not only put in place, but strictly adhered to. Following tried and true hair principles can steer your child towards healthy, consistent hair growth. Wash the child's hair every seven to 10 days keep her hair clean as well and to rid hair follicles from any buildup from hair products. Select a shampoo based on the needs and texture of the child's hair. Shampoos with balanced pH are best for maintaining the natural acidity of the hair while making it manageable. The best shampoos are those containing lauroamphoglycinate, cocoamphacarboxyglycinate or a sulfosuccinate and water. Be sure not to over-wash as this causes brittleness, which results in breakage. Lather approximately 1 tbsp. of shampoo into the child's hair, gently massaging the shampoo into the hair. Use your fingertips to work the shampoo through the hair using circular motions. Apply conditioner to the hair immediately following the shampoo process. Conditioners are essential because they make the hair softer, more manageable and stronger, provide sheen and protect the hair's inner structure. This protection results in stronger, less brittle hair, which aids in the growth process. Instant conditioners, either leave-ins or the kind you rinse out are recommended. Use of a leave-in conditioner provides ease of styling and acts as a protectant to the child's hair if it is blow dried. One caveat with using a leave-in conditioner is that it may leaves a filmy residue on silkier or finer types of hair if it is of a heavier consistency. Light spray leave-in conditioners are a good choice for brushing, combing and styling the child's hair. To apply conditioner to hair, after squeezing excess water from the child's hair, section the hair and add approximately a handful of conditioner, working it through the hair. Using a wide-tooth comb, gently comb the conditioner through the hair to get rid of tangles. Visit a hairstylist to get the child's hair trimmed to get rid of split ends; this promotes healthy growth. Every six to eight weeks is recommended. Moisturize the child's hair using a daily moisturizer rich lotion or oil. Pay special attention the ends of the child's hair, ensuring they are kept well-moisturized to prevent split ends and breakage. Choose moisturizers that are light in consistency, not thicker ones that tend to gob up on the hair and weight it down. Avoid using any hair product containing petroleum and mineral oil as these are not easily absorbed into the hair's follicles. Avoid excessive brushing and combing of the child's hair. Too much brushing and combing pulls and tears the hair out. Invest in the proper comb and brush for the child's hair type. Avoid the use of heat styling products and chemicals on the child's hair all together. 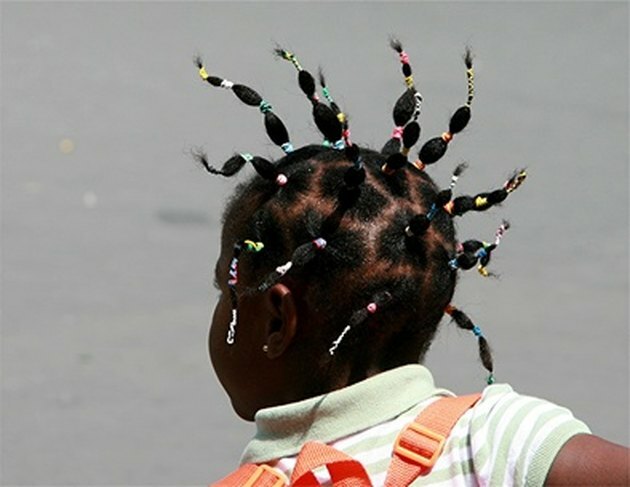 These styling processes can be detrimental to the overall and long term health of his or her hair. Natural hair that is free from chemicals and the ravages of heat styling is recommended to achieve consistent growth. Styling processes that rob the child's hair of moisture, cause split ends and breakage should not be used. Practice use of protective styling, such as braids, twists and cornrows. These styles are not only age-appropriate and flattering for the child but also prevent any need for harsh hair styling practices. Styles that work with the child's type of hair and natural growth pattern are best. The idea is to cause as little stress as possible on the child's hair. Adapt the child to healthy eating habits to provide proper nourishment required to sustain regular hair growth. Ensure she drinks enough water every day to keep well hydrated. "The Pennsylvania Child Welfare Training Program: Hair and Skin Care for African American and Biracial Children: A Training Workbook"